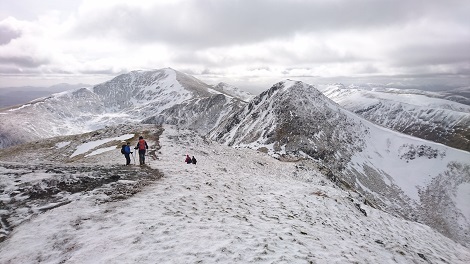 The middle of the month saw another dump of snow, but milder weather melted a lot of it. 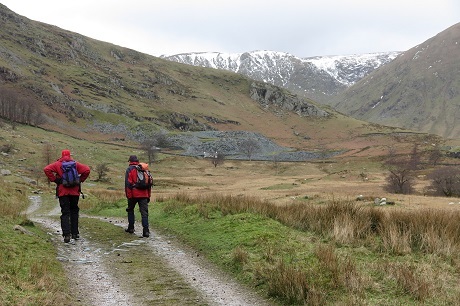 With storm Gareth passing through, the tops were too risky so a short walk up Kentmere seemed appropriate. It was also an opportunity to visit Rods tree - see January 2019. Here is Hugh by the tree. Roger writes - Many members will remember that Sid Cross was an early Fellfarer and Newsletter editor. Some time ago I visited Sid Cross’s memorial seat on the lower slopes of Loughrigg, behind Sid and Jammy's retirement house in Clappersgate. It was in a sorry state, rotten and falling apart. 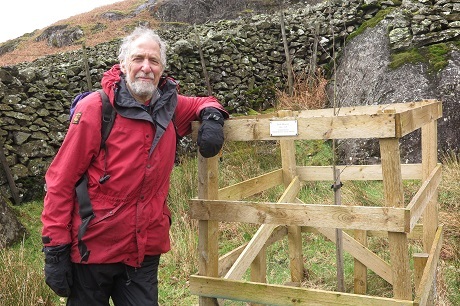 I tried to get involved with a replacement, via Langdale/Ambleside MRT, but to no avail. Since then, member Jenny Scott told me it has been replaced by who???? possibly Sid’s son or LDNP. Anyway I visited the seat today and a fine replacement it is, still of course with the same view. 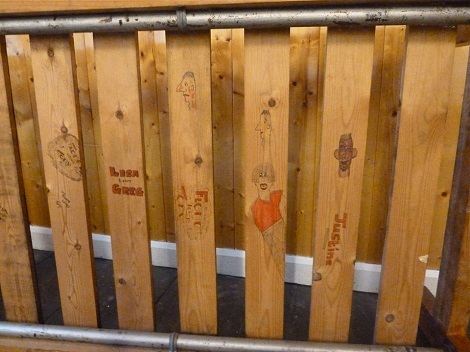 The carved dedication has been updated to include Jammy. 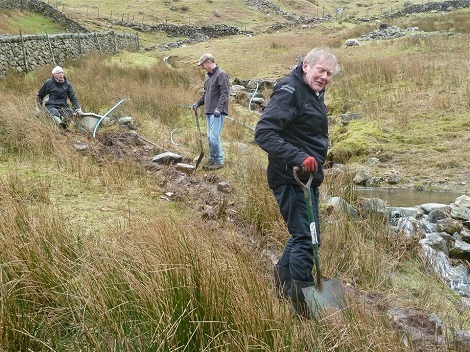 The main outdoor job was to dig a trench for the NT to connect out water supply to the supply to the farm. 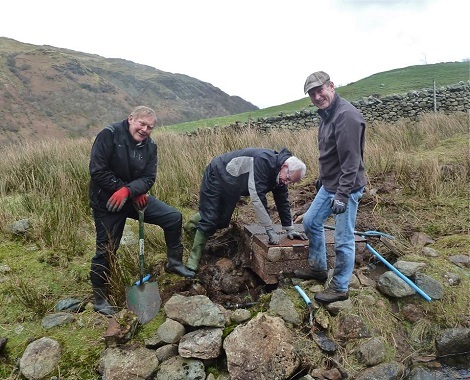 Here are Mark, Gavin, and Stuart getting on with the dirty job. 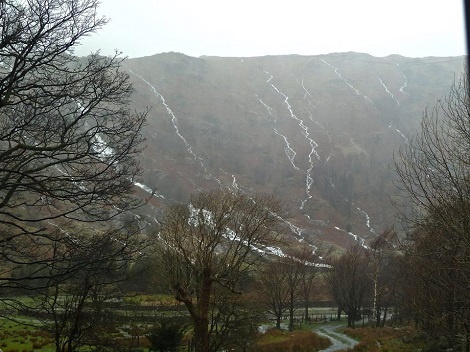 It was very wet on the Saturday, and below is the view out of the common room looking down the driveway across to Sour Milk Gill. Here is a link to a video on the club Facebook page. 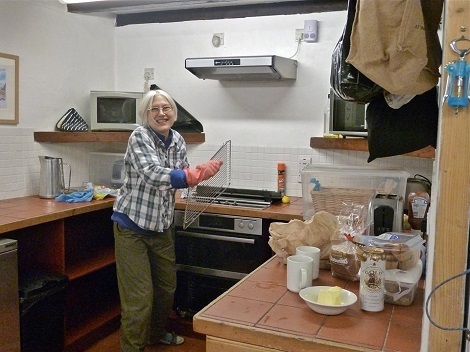 Meanwhile, Maja did sterling work scrubbing the floors clean. 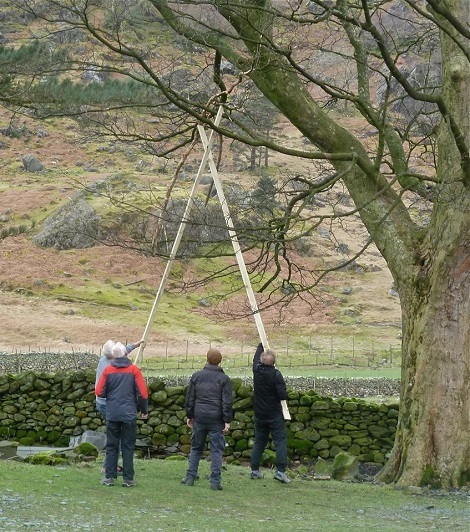 How many Fellfarers does it take to dislodge a branch from a tree? 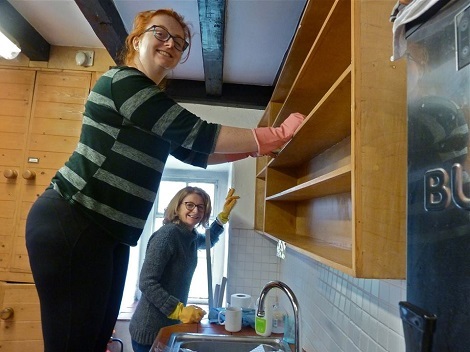 We used to sweep our own chimneys, but the NT now insist we have them swept regularly by approved sweepers. 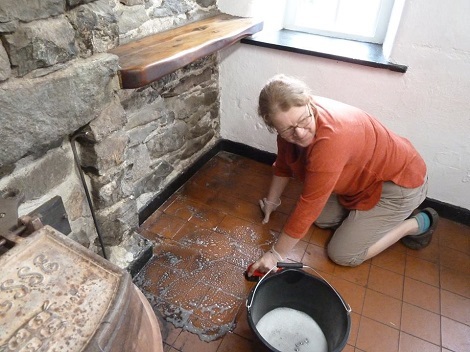 Meanwhile, members were getting on with regular jobs of our own, giving the place a thorough cleaning for one thing. 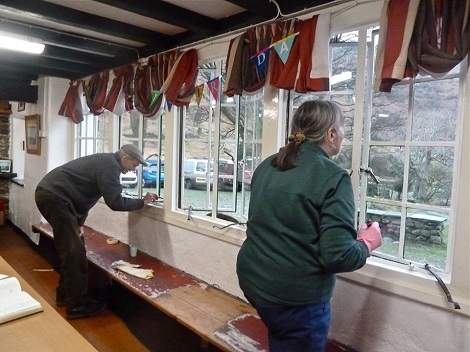 We have a painting schedule to work too, and this time it included the common room window frame. Below are Peter and Krysia. 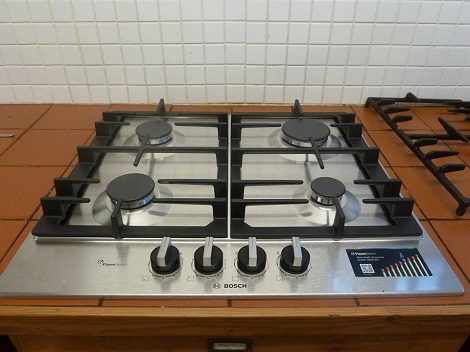 Two new gas hobs were bought and installed in an attempt to stop problems with lighting the jets. 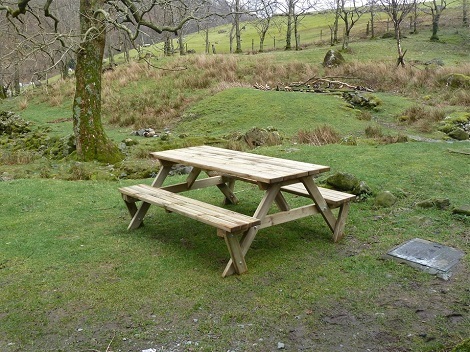 Rod's memorial picnic table was assembled. It now needs a location in which to fix it. 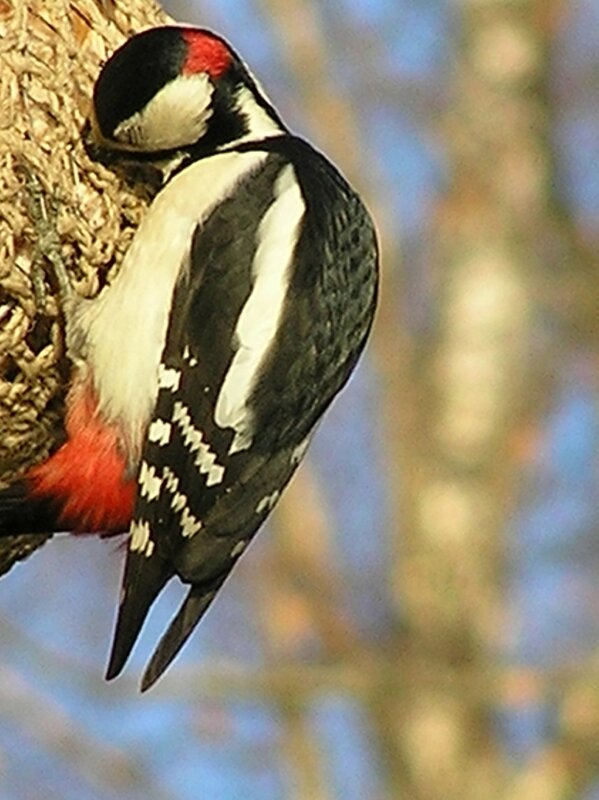 A return visit to Killin following last years great five nights, led to another very successful meet, with 28 members (30 on Sunday night) enjoying 4 good days without rain, though with some strong wind. 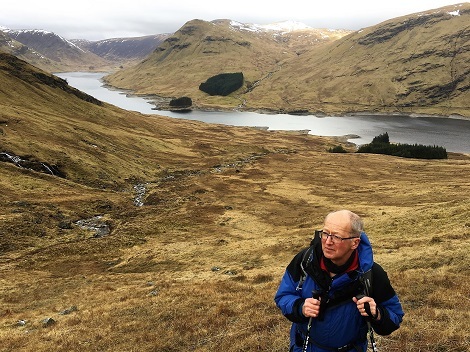 A variety of low level walks were made, as well as Munros, Corbetts, Grahams, and Hugh's ascended. A good hotel in a good location, what more could we want? Norman,Mick, Mike Wilson, David, Adele, Graham, Lynn, Ellie, Margaret, Ruth, Ray Garnett, Irene, Chris, Angela, Kevin, Sheila, Harry, Clare, Ray Wilson, Angie, Val, Jean, Hugh, Jenny, Fred, Mike Walford, Jan, Mel. The hotel on arrival, looking towards the Tarmachan ridge. 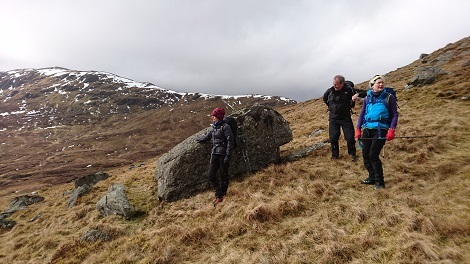 Two groups drove along to Lawers village for a walk along the Ben Lawers ridge. 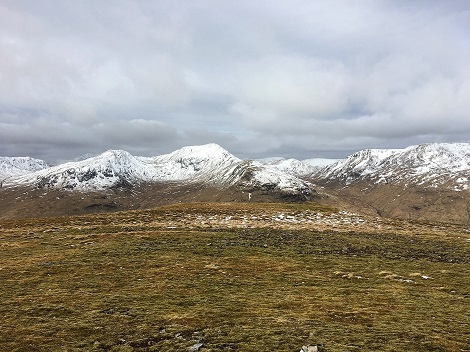 The route leaves Lawers village and goes over the four Munros of Meall Greigh, Meall Garbh, An Stuc, and Ben Lawers - a classic day out. 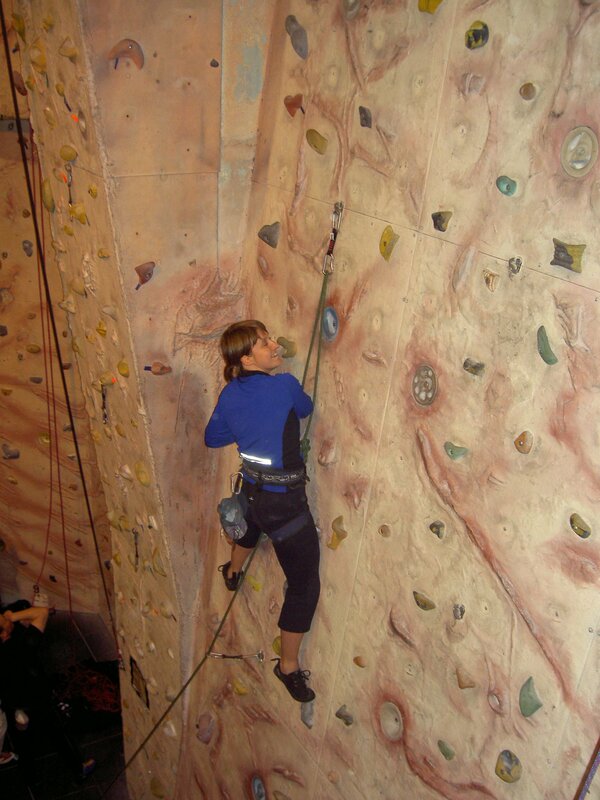 The group consisting of Kevin, Jan, Mel, Harry, and Angela, completed all four tops, whilst the other group of David, Mike, and Adele completed the first two. 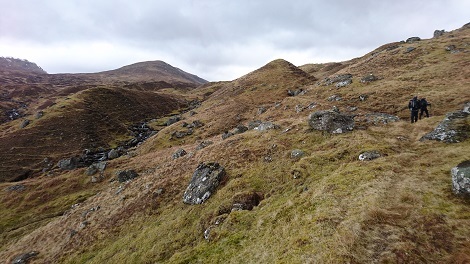 Right is leaving Meall Garbh for An Stuc, with Ben Lawers in the far distance. 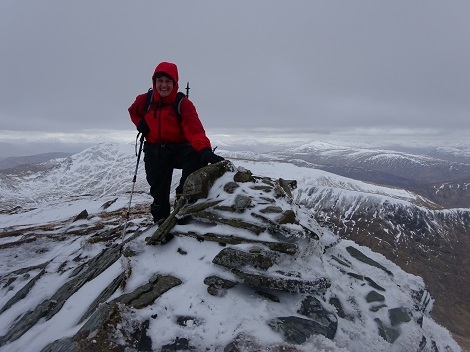 Below left is Mel on An Stac summit. Below right the view back from Ben Lawers to An Stac and Meall Garbh. 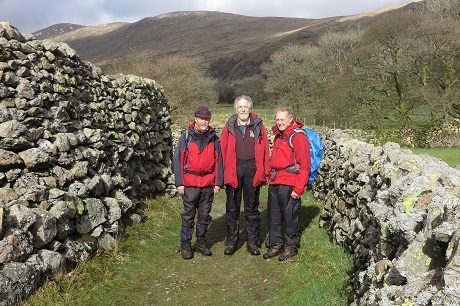 Mike Wilson and the two Ray's ticked off Meall Glas situated between Glen Dochart and Glen Lochay. 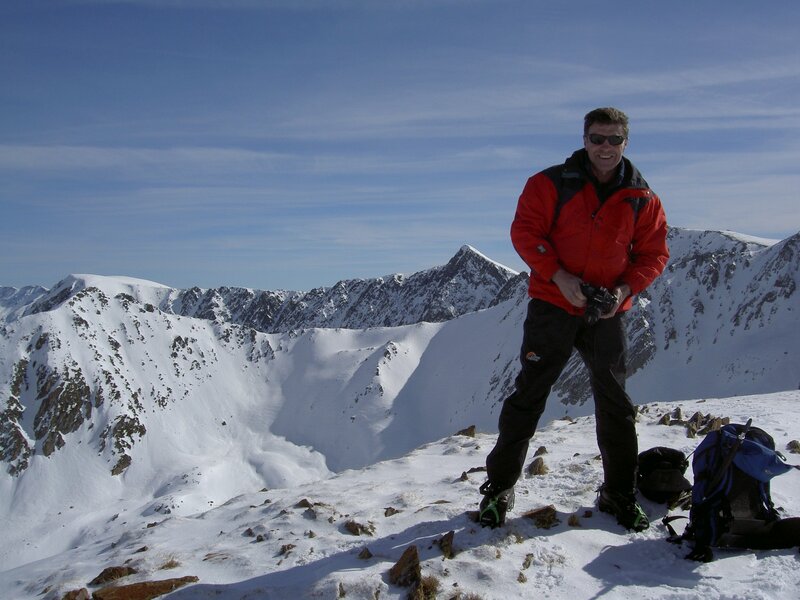 Below left are the two Ray's having lunch on the summit, and below right the view from the top. 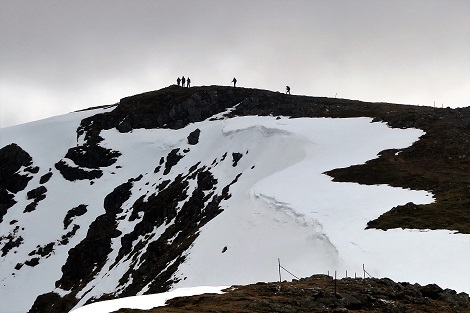 The largest group decided to ascend the Corbett Meall Luaidhe from the road over to Glen Lyon. 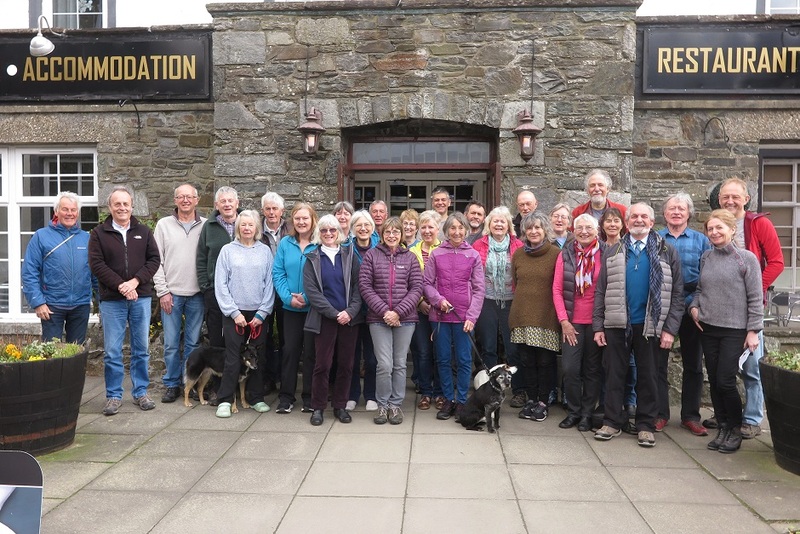 Here they are on the summit, from left to right - Colin, Graham, Irene, Chris, Angie, Mick, Val Calder, Val Hunter, Clare, with Hugh taking the photo. 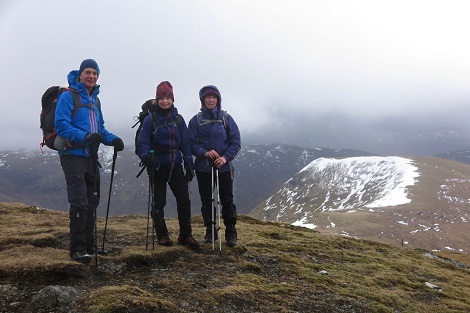 Three groups drove round to Glen Lyon and up to Loch an Daimh to ascend Stuc an Lochain. Norman, Jenny, Kevin, and Jan were in one group, Mike Wilson, and the two Ray's in the another group, with David, Mike, and Adele in the third group. 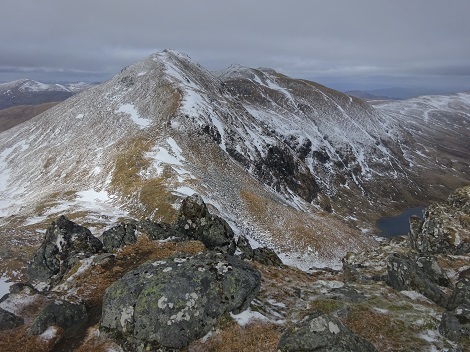 Below is the ridge to Stuc an Lochain. 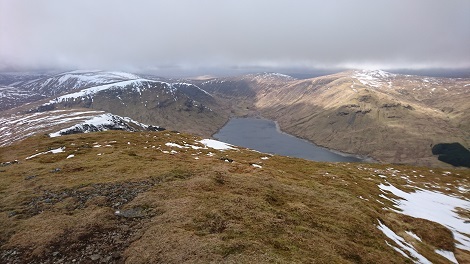 Middle left are Kevin, Jan, and Jenny on the summit, and middle right is the view from the summit looking north west to the head of Loch an Daimh. 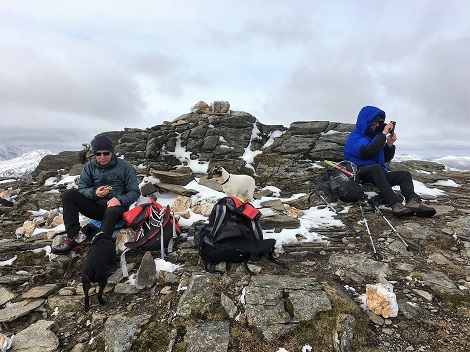 Botton left is Mike W on the way up, and below right are Ray and his dog Gem on the summit. 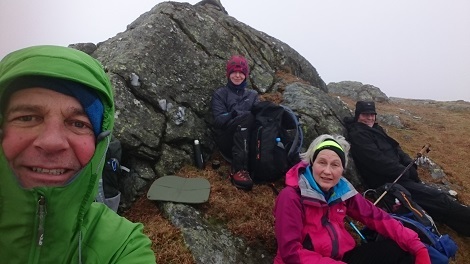 Angie, Val, Chris, Ruth, Clare, Irene, and Hugh had a go at Beinn Ghlas from the car park, but very strong winds on the summit ridge forced them back. 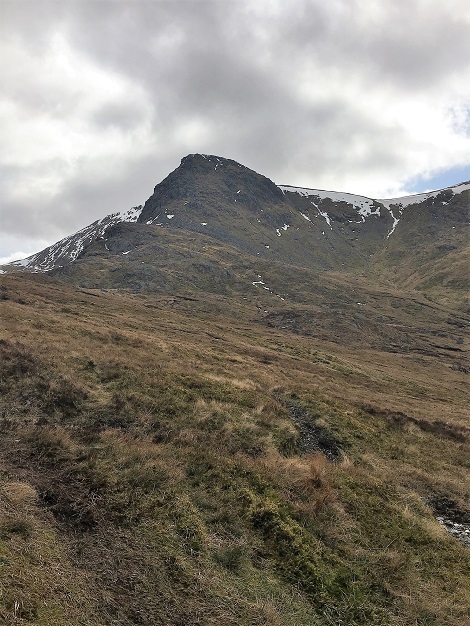 Here is a photo with an interesting cloud formation, taken on the way up, with Meall nan Tarmachan behind. Left is Chris, Mel, and Angie with the shapely peak of Ben A'n behind, and right is Angie on the lovely rocky summit with Loch Katrine behind. Mike W and the two Rays decided on Sgiath Chuli, again between Glen Dochart and Glen Lochay. 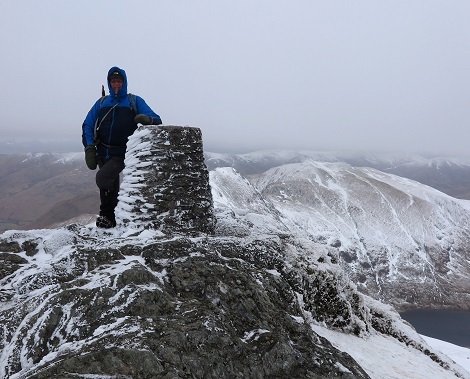 Here are Ray Garnett and Mike Wilson on the summit in poor visibility assessing the route down. 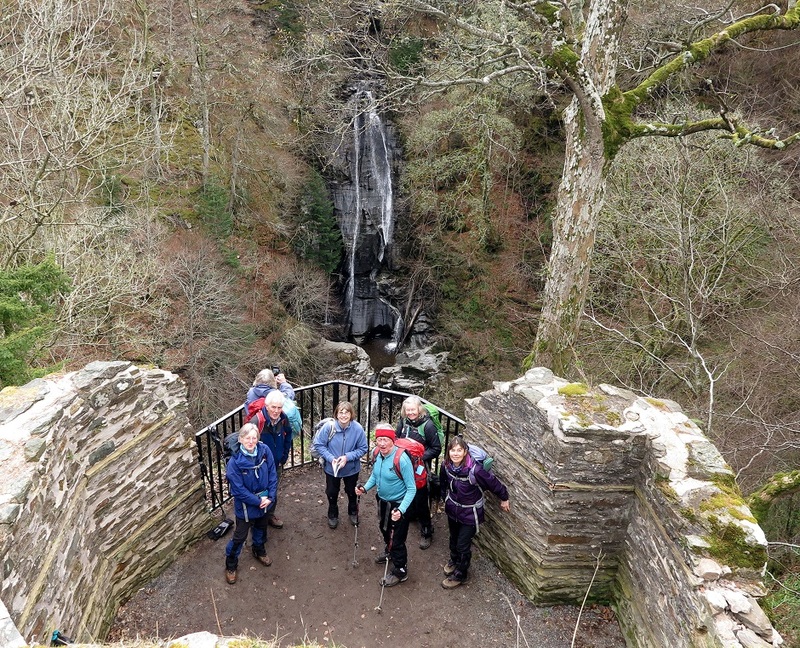 A group of 8 headed along to the east end of Loch Tay to visit the Falls of Acharn and the Queens Drive. Val, Clare, Graham, Irene, Mike, Adele, and Jenny at the Acharn Falls, with Norman taking the photo, and David not in shot. 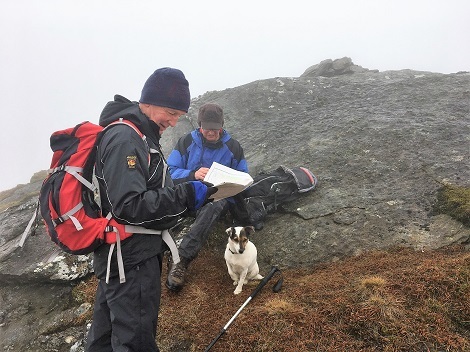 Mick wanted to up his count of Corbett's by ticking off Beinn nan Oighreag, which at 909m is nearly a Munro. 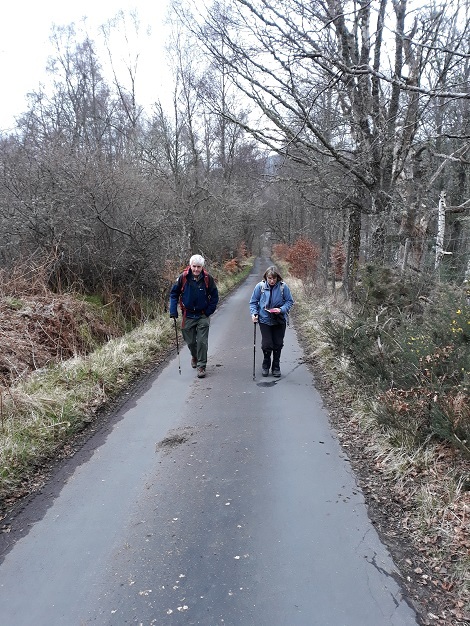 Mick, Jan, Kevin, and Ruth walked in from Glen Lochay, a longer route than from the Glen Lyon pass, but easier angled. Right is on the ascent, with the objective in the distance. 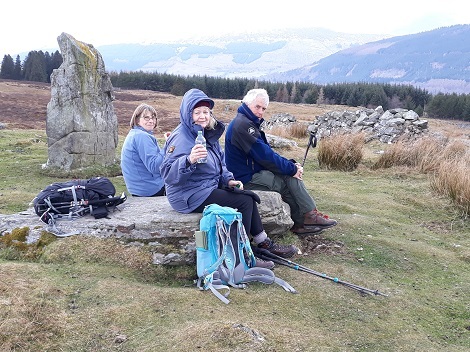 Below left is a selfie on the summit of Kevin, Jan, Ruth, and Mick. Below right are Jan, Mick, and Ruth on the descent. 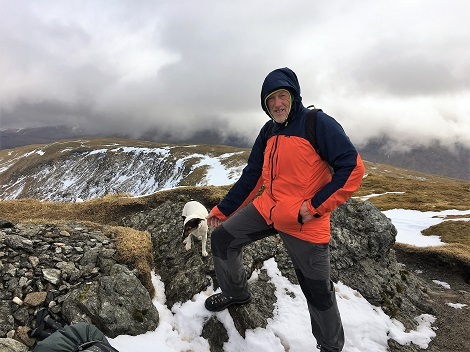 Seven members headed over to Loch Earn to tick off the classic pairing of Ben Vorlich and Stuc a Chroin. 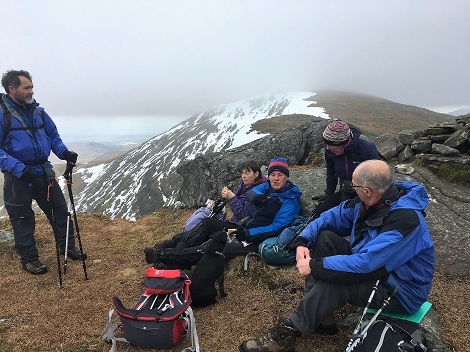 Below left are Harry, Angela, Ray Wood, and Mike at the top of Ben Vorlich 3,232 ft, and below right Harry,Jenny, Norman, Angela and Mike resting at the first cairn on Stuc a Chroin after a tough scramble up the steep face. Still 25 m to go to the very top. 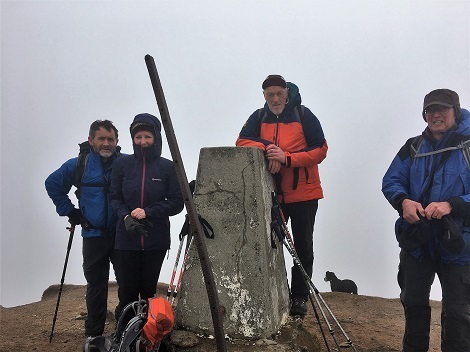 Mike, Ray G, Ray W, Harry, and Angela on the summit of Stuc a' Chroin. The Falls of Acharn and the reconstructed Crannog proved popular, and seven more members made a visit. Below left are, from the front, Margaret, Ellie, Ruth, Jean, Fred, and Sheila, with Lynn taking the photo. Below right are Ellie and Jean at the Crannog. 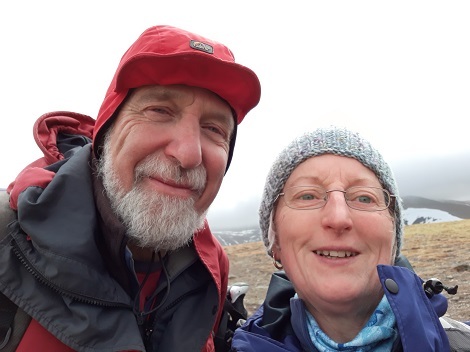 Val and Hugh ticked off the Munro Meall a' Choire Leith. Here is a selfie on the summit. Purple saxifrage spotted by Angie and Irene on the road over to Glen Lyon just before the dam. The final night coincided with Mick's birthday. Here he is blowing out the candles on his cake watched by Irene. Being Mick's birthday as well as the final night, some people just had to go to the nearby pub. 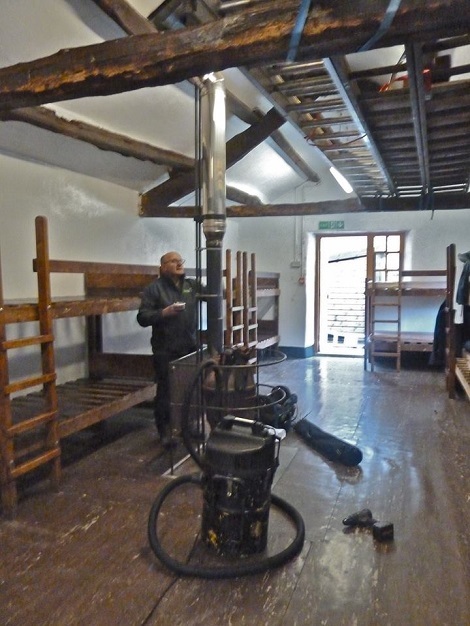 All meals were taken in the hotel dining room on one long table.